(Newser) – Bride-napping sounds like a serious crime—except that Romanians like doing it every week as a means of spicing up ordinary weddings, the AP reports. Typically the wedding party will be in full swing when friends of the bride abduct her, take her to a popular tourist spot, and demand a ransom from the groom ... like whiskey or a promise of undying love. Oddly enough, a football player inspired the kooky custom by proposing to his girlfriend. what a dumbazz thing to do. Go read O'Henry's "Ransom of Red Chief". 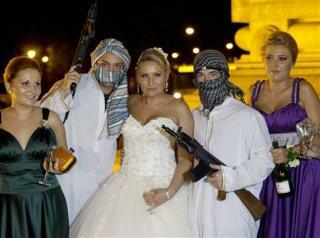 Single women almost kill themselves catching the floral bouquet..imagine the bloodshed when the bride tosses that AK-47 over her shoulder!! !